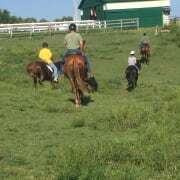 We are looking for good people who would like to work with individuals with disabilities and horses. We need volunteers to side walk with students as they recieve therapeutic horseback riding lessons from their PATH Instructor. Volunteers are also needed to groom horses and help in the stables. No experience required, we will train you. E-mail Linda at 1bftrc@att.net or call 740-872-3220. Requirements: A good attitude, like working with horses and individuals with special needs. Ability to walk for 30 minutes.